Accessory Genie - Consumer Electronics and Accessories Industry News: Clip it on and have some fun! Everything nowadays is Bluetooth: phones, tablets, alarm clocks, handheld game consoles, GPS, etc! Don't you remember the "old times?" You know, the days where you just had to find a 3.5mm or USB port and plug something in?! Granted, I'm not against Bluetooth technology; it comes in very handy! There are no cables to get caught in, you can move and still hold a conversation or listen to your music at the same time. However, it is nice to get back to the old way of things....at least for a while! 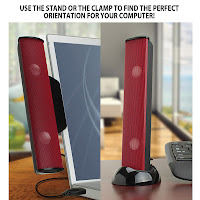 When I heard about this clip-on speaker I got a bit excited, because I can still have powerful sound, BUT through a USB port. The GOgroove SonaVERSE USB Clip-on Soundbar is a speaker for your desktop, laptop or notebook. It is the ideal companion for watching movies or videos on your device! 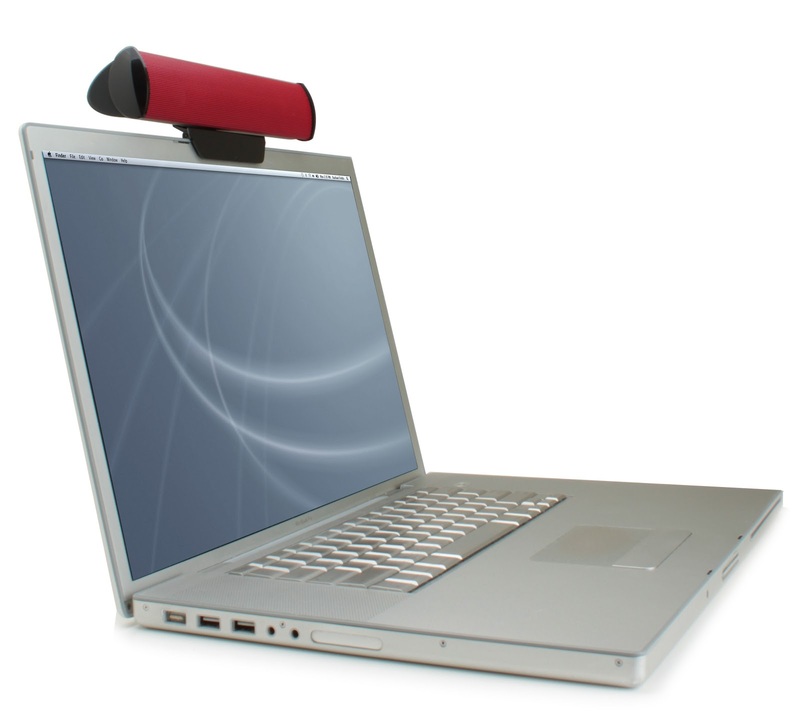 All you have to do is plug it into a single USB port, clip it onto the top of your laptop or desktop and you have instant sound. Don't worry: you won't scratch your screen. There are rubber grips on the clasps that prevent any damage! You can also have the Soundbar next to your device with the optional stand. It's your choice: the stand and the clip are removeable! With the on-board volume control, you have the power to raise or lower the sound. Believe it or not, it only weighs 8 ounces! Now, you can easily throw it into your backpack, purse, briefcase or messenger bag. It is on sale this week for 50% off with the coupon code only found in the Accessory Genie newsletter! I know I'm a bit "old school" - or shall I use the politically correct term and say "vintage" - but not only is the SonaVERSE USB Clip-On Soundbar a unique because of the pPlug-N-Play feature, but it also comes in a HOT color: red! Finally, an item that has some character and can give me a bit of inspiration as I get my (GO) groove on! Sign up for our weekly newsletter to receive the most-updated information on new products, special discounts (like this one! ), promotions and more!